Put on the whole armor of God that, ye may be able to stand against the wiles of the devil. Wherefore take unto you the whole armor of God that, ye may be able to withstand in the evil day, and having done all, to stand. When we are born again as children of God almighty, there is a period where we will live happily with Christ Jesus, in his bosom. During this period, Satan will not interfere with us. This is when we are recruited into the army of God and this period I would like to refer to as the induction period. Everything will be extremely nice and rosy like a honeymoon period. (As reflected in Songs of Solomon). After the completion of this period, we are sent out into the world. This is when Satan will attempt to defeat us and this is when we fight and defeat him being a seasoned soldiers of Christ. We are given a mission in life, which is a ministry to serve the Lord on this earth. Our challenge is to reconcile sinners to Jesus. Every born again child of God is a part of God’s ministry. God has a task for every child of his. Some introduce Jesus Christ to millions and are powerful preachers whilst some bring a single person to the Lord during their entire lifetime. Regardless of the numbers, every child of God has some kind of a ministry and plays a part in extending the kingdom of God. Some may not realize the role that they play and its importance, but In order to fulfill this mission of reconciliation we need to be soldiers in Christ. The rigorous training we go through and the more trained and equipped we are, the more souls we can win for the kingdom of God. An important thing that we need to realize is that, Christian Life is, a life full of trials… as saints say it is never a ‘bed of roses’, but we can over come all these trails and become victorious only if we are trained strong soldiers. As many trials flood our way, we can overcome them with confidence and be encouraged by them, and face the many that awaits us for the future by being strong soldiers in Christ Jesus. It is clear that our enemy is not HUMANS. We fight against evil spirits. If someone is being rude and cruel to you, do not think that it is that person…it is truly not him. It is the evil spirit working through that person. We need to clearly identify the enemy, in order to defeat the enemy or else we will fight against human beings…if we do this, the enemy will continue to fight with us through different people, repeatedly. The person may change but the battle will remain! Once we discern and get our focus on the enemy, which is the spirit, it will be easy to fight the battle and also to forgive that person. Then we will understand that it was not the human person who rose against us, but Satan used him against us for his evil advantage. A good soldier has to have six key weapons in place constantly. You cannot afford to miss out even one. 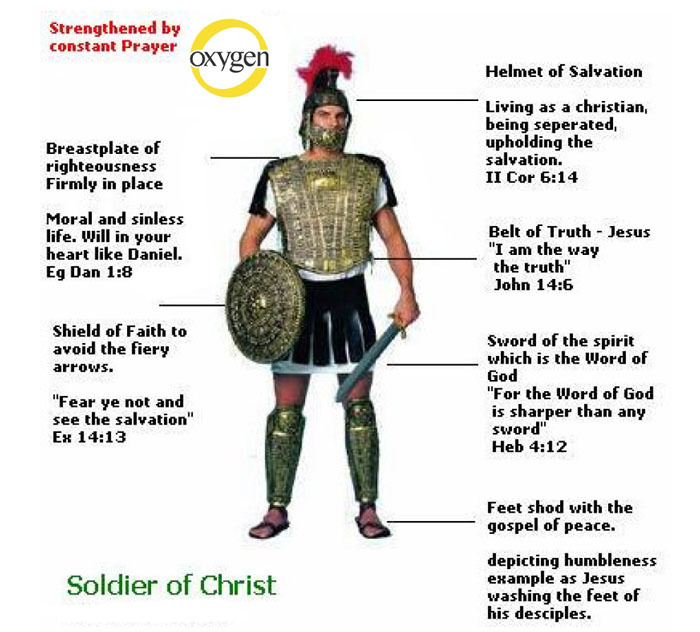 “Put on the whole armor of God”. Let us look at each one separately in the chronological order mentioned in the Bible. What is a “Belt of Truth”? We know that God is Truth. In the Old Testament, we read about this. This truth was transferred into Man to dwell in him, through Jesus our Lord and the Holy Spirit. Joh 14:6 – Jesus saith unto him, I am the way, the truth, and the life: no man cometh unto the Father, but by me. We know Jesus is the living truth. Today you and I have him in the form of the Holy Spirit dwelling within us. While Jesus was on earth, he said the spirit of truth is with you and shall be in you. This means he is now with you and later will be in you. In other words, I am with you and now and will be in the form of the Holy Spirit later. Hence we need to buckle on the belt of truth. This is one of the first things we do in a Christian life and certainly amongst the first weapons we put on as a soldier. Be filled with the Holy Spirit and invite Jesus into your life and heart. Buckle up. NIV mentions as “breastplate of righteousness in place”. The breastplate is worn only once in preparation for battle, just like the belt of truth. Typically, a soldier will wear the two when his duty or shift commences. However, according to NIV the breastplate has to be firmly in place i.e. properly fixed. Breastplate once worn firmly protects our vital organs from attack. Injury to other areas we can recuperate, but when the breastplate is loose and not in place, the wound can be fatal. lives and if we do not cast that away, the breast plate will not sit firm on our body and we will be in constant threat of attack to the vital organs. Hence, we need to make sure we are living a moral and sinless life. One example we can look at is Daniel, a man who purposed and willed to keep his breastplate of righteousness, always firmly in place. Feet stand for humbleness and lowliness. Jesus washed his disciple’s feet as a mark of humbleness. In addition, God said, “I will put your enemies under your feet” which marks lowliness. NIV mentions, “Your feet fitted with the readiness that comes from the gospel of peace” With the feet you cannot fight, a soldier has only one use of the feet that is, to maneuver or place himself strategically in battle. Our mission is to do our ministry but when the evil one comes to attack us, we are able to stand firm with our feet because we are humble enough if necessary to wisely move away and avoid conflict with evil. Mat 10:16 – Behold, I send you forth as sheep in the midst of wolves: be ye therefore wise as serpents, and harmless as doves. A serpent will always humbly and wisely move away and avoid trouble but when harm is inevitable will stand its ground. This is the most important weapon to any soldier. With this, he can stand a siege even if he is naked. He can hide himself with the shield and always be protected, he will not gain ground but rest assured, he would be protected until help arrives. Any problem in life, which comes in the form of trials, temptations and sins, these are like arrows, which come to hurt us. If we hold up our faith shield on time, we will not be prone to injury, if not the arrows will pierce us. We will not die by the grace of God because of the helmet of salvation (see below), but these trials (arrows) will certainly bring us down and to recover from it we need some time and this will cause unnecessary pain as well. Every body that is born again is given the shield of faith by Jesus. But we need to know how to use the shield of faith in the appropriate manner. Be alert, see the arrow and the direction it is coming from, and raise the shield of faith at the correct time. Most children of God get mesmerized when they see the arrow of trials; they are frightened and they keep staring at the arrow until it pierces them. Moses said to the children of Israel at the Red Sea when the Egyptian army was in pursuit. Moses said see the “salvation of the Lord” in other words, see how you will defend your self with the help of God and use the shield of faith. They were mesmerized and frightened by the Egyptian force that they could not see the redemption and did not use the shield of faith. In today’s world when the arrow comes, yes it will startle you and yes you will instinctively worry, but immediately within seconds use the shield of faith and say to yourself “Jesus my saviour will save me”. You will see how our precious Lord redeems you. Psalm 34:19 – Many are the afflictions of the righteous: but the LORD delivereth him out of them all. will save me” It is pointless telling the doctor because we should know who our enemy is. This armour is an one-time gift from God. Helmets are like caps, which signify a soldiers rank and seniority given by his superiors as a reward. However, our salvation helmet is given by the father as a free gift, as we have done nothing to deserve it. However, we need to always wear it, which is live, breathe and act meriting your rank and platoon. We cannot be part of the old habits, systems, sins and likings anymore. We are saved now and need to be separated and decorated. We are a new creation in Christ Jesus. 2Co 6:14 – Be ye not unequally yoked together with unbelievers: for what fellowship hath righteousness with unrighteousness? and what communion hath light with darkness? All the other weapons we studied are defensive, This is the only offensive weapon we use, which is mentioned by St Paul lastly, easy to acquire, but takes time, energy and will to master it. Heb 4:12 – For the word of God is quick, and powerful, and sharper than any two-edged sword, piercing even to the dividing asunder of soul and spirit, and of the joints and marrow, and is a discerner of the thoughts and intents of the heart. We learned that our enemy is not of the flesh it is spiritual. Hence, this is a war-fare of the unseen, Soul, Mind, Heart and Spirit. As we read above the word of God is a quick and powerful sword sharper than any natural sword, the discerner of thought and intent. The sword in a child’s hand cannot harm anyone, on the contrary in the arms of a master swordsman’s it becomes a deadly weapon, why? Because of the years of experience and the level of maturity. It takes years to master the art of swordsmanship, ceaseless day and night practice. Hence, it is not of any use if we know a couple of promises in the Bible. We should read, study and meditate the word of God day and night and then we will be able to use this weapon to its fullest potential. “For it is not ye that speak, but the Spirit of your Father which speaketh in you”. A soldier needs strength, without strength he will be tired and fatigue will set in. With all weapons at his disposal and with the skills and knowledge of using them, he will not be able to do anything. How do we get strength?. Through Prayer. Note the word “always”. Our human body gets strength from oxygen. The body breaths always, a constant autonomous uninterrupted rhythm. Like wise prayer should be constant. The prayer should constantly strengthen the spirit. This does not necessarily mean that you kneel down and pray always, but in what ever you do you give thanks to Jesus and do it with prayers. Even when you take a walk, pray and do not let your mind wonder after the eyes and the other senses. Walk in the spirit and pray in the spirit and you will not be distracted, instead you will be strengthened. I’ve been through a terrible and thankfully short marriage to a man who seemed so perfect before the marriage.. Even though in that marriage I was aware that we do not fight against flesh and blood, and kept trying to see past his hurtful behaviour, and even spoke to him about being closer to Jesus so that he would be able to address his controlling, lying, philandering and inconsistent behaviour – he didn’t see that he was doing anything to harm me. Unfortunately, I did not always wear the shoes of peace either, and it brought out the worst in me – which obviously needed rooting out too, so I could examine it, pray over it, seek forgiveness for and be humbled by.. I have been so hurt and humbled by the whole experience that indeed I understand what is meant by Satan comes to rob, steal and destroy – and he almost succeeded in killing me. Thankfully, The Lord did save me, removed me from there, and is in the process of restoring me. I can say that I have learned so much about God’s faithfulness and constancy and it has healed my deeply broken heart and brought me home again to Him. I’m resting and beginning to step out in faith that He is always faithful, always constant – something my husband wasn’t – poor thing – I feel so sorry or him and have been able to forgive him. In seeing how I haven’t always been faithful and constant to God, Jesus and the Holy Spirit, I was able to see how my husband was also under attack – and so blind to it that he was unable to save himself through Christ – but I have forgiven him, and in doing so, feed myself from these horrid feelings of jealousy and destruction – for I too was under attack. Our happy dream of love for one another and contribution to the world wasn’t something satan was ever going to tolerate. He nearly destroyed us both. If only we could have lived as the author of this insightful and gifted author writes. Thank you, author, whoever you are, for faithfully being God’s servant and writing this article. I shall live by its understanding ever more. What an insight message!. May the Lord Jesus Christ strengthen me in the coming days. I thank our Lord Jesus Christ for providing this message. Let this not go to my mind theoretically, but let the Lord grant me mercy to apply this to my heart and do it practically everyday.